And so we reach the end of Season 2. Now, as you may remember, there was some discussion raised at my decision to place "Flashes Before Your Eyes" after the hatch implosion as opposed to in 1996. You can click the post I linked to if you need a refresher on my decision. Now, I had an interesting suggestion today from a reader that requested I put together an alternative version, that has "Flashes" occurring in 1996, instead of 2004. I think something like that might be possible, and at the very least would offer some satisfaction to those that would have preferred I put the episodes together the other way. I'll work on that and try and post the affected episodes when I can. 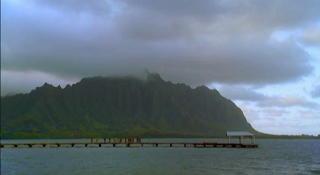 But, back to our episode, the Others lead Jack, Sawyer, Kate and Hurley out to the end of a pier, where they wait for Ben to show up. Ben introduces himself, and gives Michael a boat and Walt so that he can leave the island, with instructions on where to head. In the hatch Desmond tries to convince Locke to push the button, but Locke breaks the computer instead. Desmond raises the blast doors and runs to get the key to turn the fail safe. As the countdown reaches zero, the clock turns back to the hieroglyphs, and the magnetic energy in the hatch starts to pull everything towards the middle. Desmond turns the key, there's a flash of light, and suddenly he wakes up in his apartment in England in 1996. He looks at this as a second chance to be with Penny again, only he runs into Eloise Hawking, who tells him that it's his destiny to go to the island, that pushing the button is the only great thing he will ever do, and that no matter what, the universe course corrects itself, so that fate plays out the way it's supposed to. Desmond plans to propose to Penny, but ends up breaking up with her again anyways. As he's sitting in a bar drinking his sorrows away, he is hit in the head with a cricket bat, and is knocked back to the present. On the rest of the island, there is a bright light, and the sky turns purple, and there is a loud pulsating noise that engulfs everyone. Eventually the light and the sound fades. Ben sends Hurley off to tell the other survivors not to go after Jack, Sawyer, and Kate, who they are taking back with them. Meanwhile, in a remote arctic station somewhere, two researchers see an alert on their system, and call Penelope Widmore to tell her of an electromagnetic anomaly they've discovered. On a side note, I wasn't totally sure how to place this sequence of events in order. "Flashes", of course, presented some logistical problems, because I felt it occurred right after Desmond turned the key, but at the same time, so did the sky turning purple and the pulsating sound. But I also didn't feel it was appropriate to split screen those scenes either. And while Desmond experienced these events while he was unconscious, he actually doesn't wake up until the next day, but I also didn't feel comfortable with the idea of splicing up his vision with what was going on with the island. So, while I didn't feel like there was a perfect solution, I liked this one the best. The episode runs 43:13 and is 352MB to download. You can stream the episode below (via Facebook), or go here to use torrents (better quality, recommended) to download the episodes to your computer. After watching this particular episode, I think you should make that alternate version. Okay, what with Desmond saying stuff like "This has happened before!" and the Charlie encounter and stuff like that, I think it does make sense to put Desmond's weirdness in this episode and not earlier. The way many fans, myself included, interpret that scene in retrospect is that Desmond in the past is remembering stuff that has yet to actually happen to him - events in his future. And that all the past events in "Flashes" actually happened in the show's world the way they are depicted in "Flashes". In fact there's nothing to contradict that. Desmond having phantom memories from another timeline is an event that occurred in the actual timeline, unless you think Desmond didn't actually go for that walk with Eloise and that somehow a phantom version of real Eloise found its way into Desmond's subconscious to exist and interact with a dream Desmond (I'm not buying it. Eloise had strong motive in the timeline we witnessed to make sure Desmond made it onto the Island. All very consistent.). There is a very strong case to be made that the way it happened is the way we saw it. Not to mention it fits much better into a chronological examination of Lost when placed farther back in time as such. Appreciate the thoughts. Since I've already given my opinion ad nauseam in the post that I linked to above, apologies if I don't have a specific response to your post at the moment.